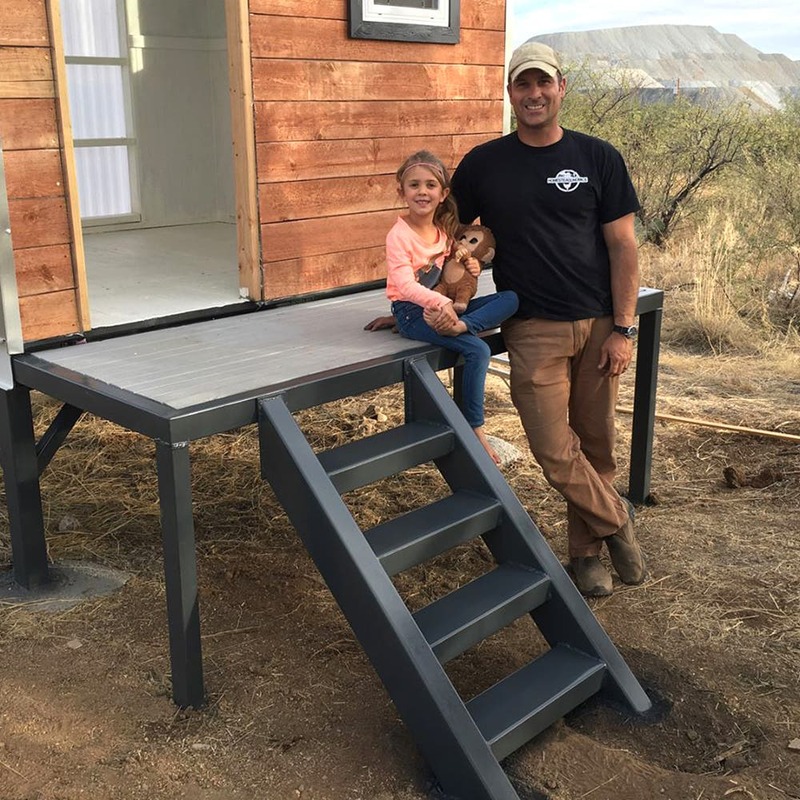 It seems like Joe Mooney of Homesteadonomics can design and build just about anything. 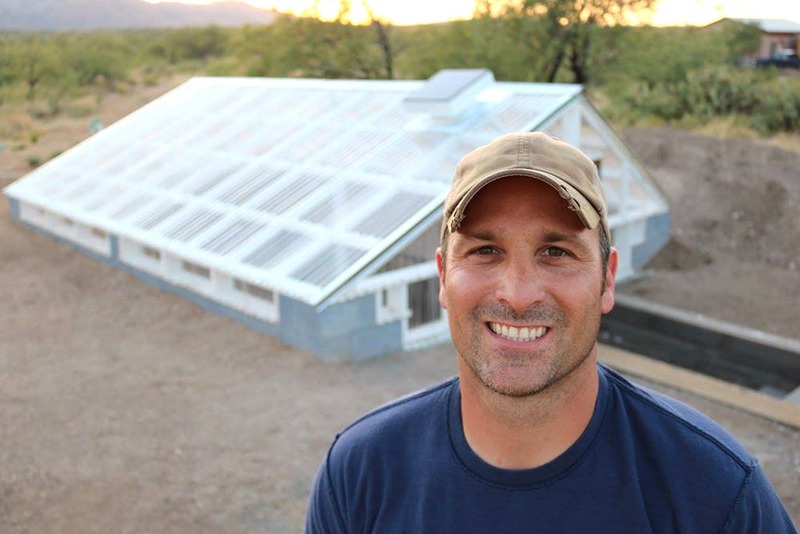 On his Arizona property, he has built his family’s home, their water catchment and cistern system, underground greenhouse, and even various tools. 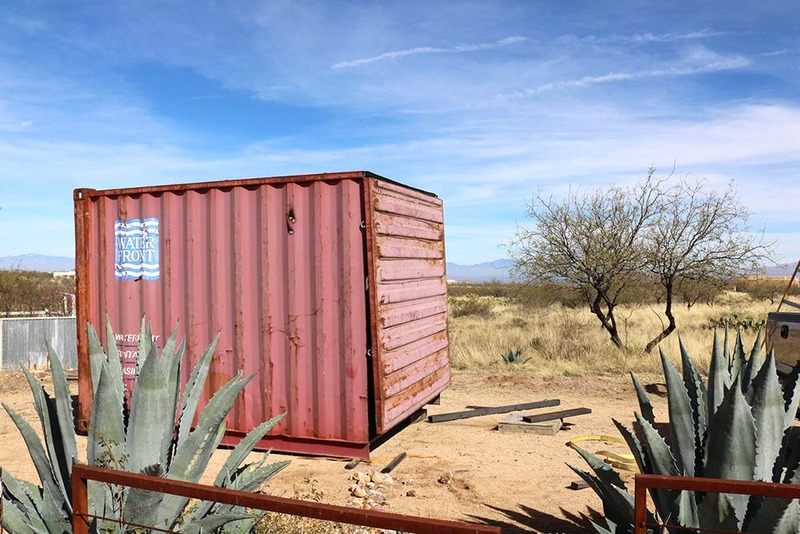 One of his largest projects to date comes from the good old shipping container and some of the container remnants. Joe Mooney of Homesteadonomics builds many of the projects (like this underground greenhouse) on his family’s property. 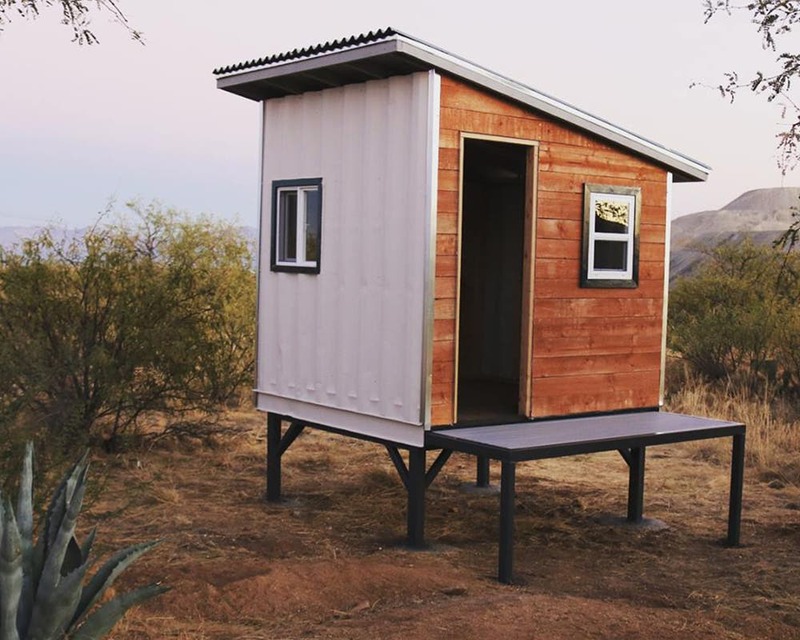 His latest project is a tiny playhouse made from shipping container remnants. After obtaining a 40-foot shipping container, Mooney cut the container in half and used a 20-foot section to build his workshop/man cave. Not content to stop there, he used some scrap sections to build the most delightful little tiny house on steel stilts. The house is primarily to be used as his daughter’s playhouse, but can be used as a guest house or family getaway in the future. 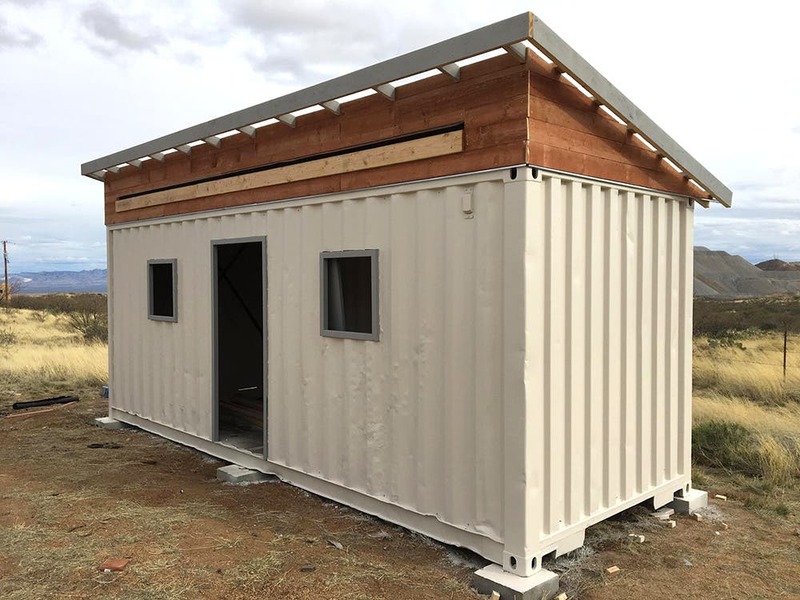 The shipping container was first used as the frame of a workshop. The leftover metal pieces of the container were used as the walls of the tiny playhouse. The rest of the flooring, roof, and deck were made with wood framing and steel. The piece de resistance is the climbing wall on the side of the house. The plywood climbing wall was painted with a desert theme by Mooney’s sister and the cute flower and mouse holds were manufactured by Atomik Climbing Holds. The interior was painted purple by Mooney’s daughter. The tiny house has some nice details like corrugated polycarbonate windows and stained siding. 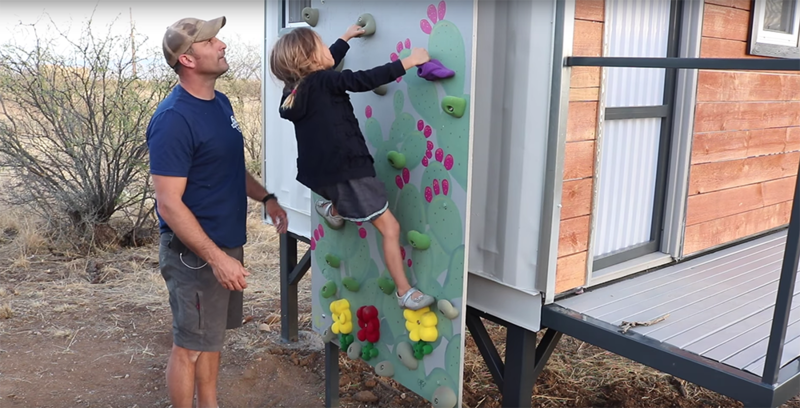 The colorful climbing wall gives this tiny house a unique look. The Homesteadonomics video series of builds, permaculture garden design, and tool use could be very helpful for anyone looking into building their own tiny house. Mooney does an excellent job of breaking down the steps of each project and showing the correct tools for the correct job. Homesteadonomics profiles various home and garden projects. Naughty Or Nice. No Matter. Holiday Gifts For The Tiny Houser.